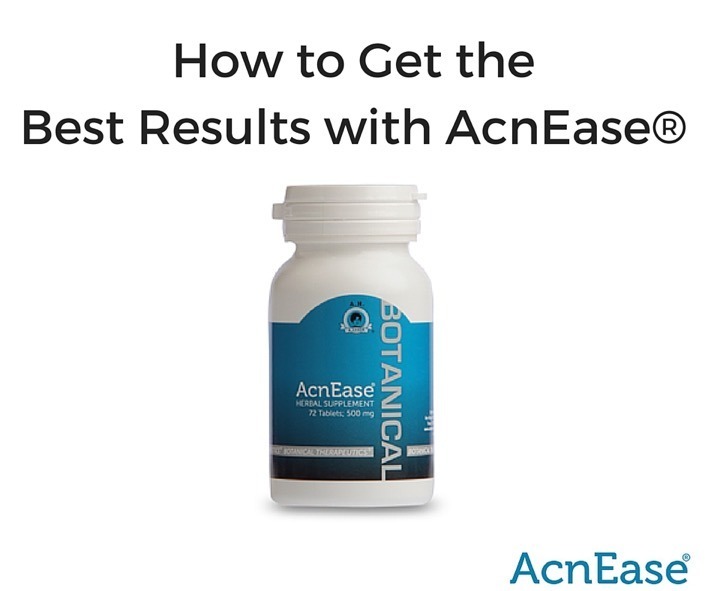 If you have just started taking AcnEase®, congratulations! You’ll be comforted in knowing that we’re not just another trendy acne treatment that may only provide temporary results, at best. With zero side effects and a 96% success rate, this systemic answer to your acne is built on a relatively simple principle: Fight acne causes, not just symptoms. The cause of acne is inside your body- so take your fight inside. However, there are a few things to keep in mind that will ensure that you have the acne-free skin you deserve. Acne is viewed as the external manifestation of an internal disorder. AcnEase® works to restore the internal balance that may be disrupted by any number of factors, including stress, diet, environmental factors or even certain medications. Not only treating the symptoms of acne that appear on the skin, such as pimples, blackheads, and whiteheads, AcnEase® works to address the underlying cause and targets the source of the problem. Simply put, AcnEase® treats existing breakouts, and works from within to prevent new ones from forming. Working as a buffer between the hormones and the sebaceous glands, which produce the oily substance known as sebum, AcnEase® treats the problem at the source. Because the AcnEase® regimen is a treatment, it should be handled as such. It’s important to remember that seeing results means putting in the legwork and because each tablet is made with the same amount of active ingredients, that work has been made pretty easy! Choose the right treatment. AcnEase® regimens are personalized to target specific types of acne such as mild, severe, hormonal acne, or body acne. Therefore, choosing the right regimen for you is the FIRST step in getting the best results. We’ve created an easy way to do this that takes less than 30 seconds! Take the recommended dose consistently. The second very important step is to take AcnEase® as recommended, and regularly, without missing or combining the doses. Being consistent will make all the difference, and the results can be seen on your skin in as little as one month if taken correctly. Like learning a new language, or staying in shape, consistency is key if you want to experience real results. The same holds true for your AcnEase® regimen. 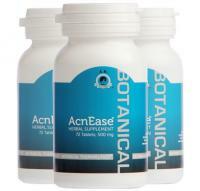 A steady supply of the superior herbs that make up AcnEase® is needed to give your skin it’s best chance. The compliance dose ensures that active ingredients are delivered to the body in an uninterrupted manner, otherwise the improvement can’t really take hold. Sticking to a schedule and taking your dose at or close to the same time every day will ensure that you get the most out of your treatment. If you miss a dose, take it as soon as you remember, and resume your normal schedule if possible. If not, take the missed dose two hours after your last dose of the day. The best results come with consistent effort, so maximize the effectiveness with regular doses. Follow instructions! If your recommended dosage is 4 pills 3x/day, this dose was developed and tested to deliver the most effective regimen for your type of acne by delivering a steady stream of ingredients to the body over a 24 hour period. Any more would go out with the waste and any less will not deliver results. So, it is important to follow the dosage instructions and take daily, as recommended. Those with chronic or severe acne may need to increase their dosage, but taking the tablets 3x/day is critical to allow AcnEase® to work day and night. Take the tablets before a meal if possible or with a meal, but NOT after a heavy meal. The ideal way to take AcnEase® is with a glass of water about 10 minutes before a meal. This will allow for optimum absorption of the ingredients by the body. If you do not like to take the tablets before meals you can also take AcnEase® with meals, ideally with a lighter fare such as toast and juice or yogurt. If you take your dose with a fattier meal, the delay in gastric emptying causes more enzymes to be released which can break down the active ingredients in AcnEase®. So, if possible, it is recommended to take your dose on an empty stomach. However, if doing so does not agree with your body, or if you have a problem with swallowing tablets with water, you can take them with yogurt, cottage cheese, apple sauce, jello or warm cereal. Anything that will disguise the tablets and make them easier to swallow! Adjust your outlook. For us to tell you to be patient and stay optimistic is easier said than done. We know you wanted your acne to be gone as of yesterday. Yet, since acne doesn’t develop in a day or even a week, the chance that it will disappear completely (without the chance of reoccurrence) in a week or two is unlikely. Maybe you’ve tried a ton of treatments that haven’t worked, maybe you’re tired of spending time and money on products, maybe you’re on AcnEase® right now and are pushing through to get the results you want – it’s important to remember that PREVENTION of acne is what will fix this issue. Prevention fixes the underlying cause, completely breaking the re-occurring cycle. If you continue to have the same outlook of wanting the problem to go away quickly, the cycle may just continue. Focusing on correcting the root cause is what will promote advancement and long-term results. Knowing that AcnEase® does this without side effects, drying or irritating the skin, or sun restrictions, making it completely safe for anyone with any type of acne to use, usually helps ease tension. So make this an achievement you can be proud of, and do the best you can to stick with the treatment, knowing you whole-heartedly gave it your best effort. If you have any questions, or need further help, don’t hesitate to call 1-877-648-5976, or email us at customerservice@herborium.com. We are here for YOU!